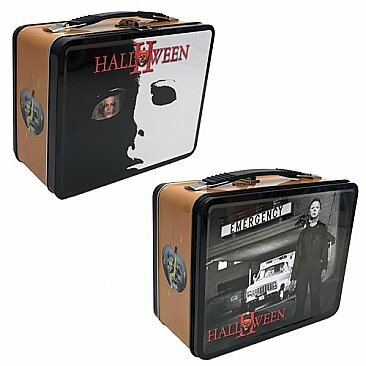 Halloween II Lunch Box! Factory Entertainment's high quality tin totes features fantastic artwork from everyone's favorite pop-culture brands! Really like the product its exactly what I was looking for. Only complaints I have is I paid for two day shipping and had to wait almost two weeks. Also the lunch box was dented in on the top but luckly it popped out when I pulled up on the handle so no biggie. Overall Im satisfied. I apologize for the delay with your order - I was away for a convention that weekend and it took me a few days to get everything back to normal and ship out all orders. Thank you for taking the time for writing this review.